Our staff will be doing everything possible to make your night's stay in the Sleep Center as comfortable as possible. The application of electrodes is painless and safe. We will be monitoring your brainwaves, breathing, heart rhythm, oxygen saturation and muscle movements. Sometimes wearing electrodes and sensors will disturb your sleep somewhat. This is normal. Your cooperation and patients is appreciated for this important test. Please bring pajamas or a two piece outfit to wear, as well as any medications you need. If you take medications before bedtime, bring them with you. Technologists may not administer any medications. Please shower and wash your hair BEFORE coming to the Lab. Don't use hair spray or oils in your hair and keep makeup to a minimum. This will ensure better adhesion of electrodes. Small gold-cupped wares (electrodes) will be filled with cream and taped to or near your chin, ears, head, chest legs and near your eyes. This takes about an hour. All electrodes and sensors are placed using hypoallergenic tape. Please let us know if you have a known skin allergy. In some cases, after the study has begun, a technologist may need to re-enter your room to reposition sensors or to begin CPAP treatment. The technologists are awake all night and you may call them if you need them. You will be on a video monitor throughout the night. Recordings are used by Sleep Specialist Physicians only. Recordings are not available for transfer or copy. The lab technologist who removes the electrodes in the morning may not be the same technologist who applied the electrodes the night before. You are expected to arrive at your scheduled time as other patients are also scheduled on the same night. Late arrivals may forfeit their appointments. Except for going to the bathroom, you must stay in bed throughout the night, resting quietly if you are awake. For patients scheduled for additional recordings the following day, please plan on bringing food for breakfast and lunch. Once you are set up for your sleep study at night, you will not be able to leave the premises to purchase food. The facility has a refrigerator and a microwave for your convenience; please ask for assistance. The technologists are highly trained and knowledgeable; however, they may not give you any information regarding your sleep study results or medical condition(s). Results will be available in 10 working days, and may be discussed in detail with your physician. Sleep study reports are sent to the referring physician(s) only. If you wish to obtain a copy of your report, please contact the medical records department. 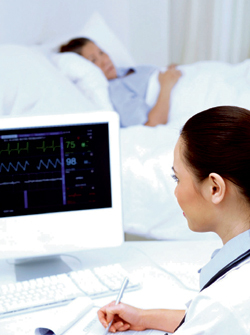 Sleep recordings are highly specialized medical procedures that require time and care in performing and analyzing. Please try to cooperate as best you are able. You can also download and print this information. See our Patient Education section on preparing for a sleep study for general information.